Although none of the items used in this effect is gimmicked, youTI have to obtain some special props to fit the theme and generate the proper atmosphere. First, you'll need tarot cards. Because of the sleights involved, you need a deck that is close to standard playing card size. 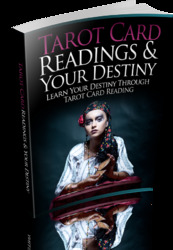 (Most tarot decks are larger, often much larger, than regular playing cards.) I have found two decks that work well. The first is the Knapp-Hall deck. The cards are about a quarter-inch narrower and a quarter-inch longer than poker-size. The second is the bridge-size version oi the Rider*Waite deck. I use the Knapp-Hall deck because I prefer the artwork. 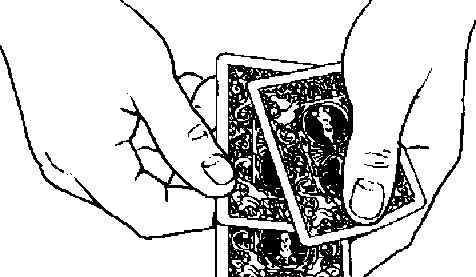 Both decks (and just about every other tarot deck in existence) are available from U.S. Games Systems. You can easily track down their web site or get their toll-free number from information. You'll need eight decks of whichever style you decide to use. Remove the Devil card from all eight and the ace of coins from five of the decks. These are the only cards you'll be using. YouU also need some kind of envelope in which to carry the cards. The critical thing about the envelope is its size. It must be large enough to allow you to easily conceal a packet of cards under it. It can be something as simple as a standard letter envelope. For aesthetic purposes, however, you might want to consider something more upscale. I use a leather envelope made by Coach Leather. It is black calfskin lined with red. (If Satan did packet tricks, this is what he would carry the cards in.) The dimensions are 4 3/8 inches by 3 inches. You'll probably want to experiment with the effect before making any major investments. A standard letter envelope will do for that purpose. In the explanation below. 111 assume you're using such an envelope. Any adjustments you might have to make if using a different kind of container should be obvious. To set up, gather your thirteen cards into a packet with the five coin cards on the face. Slip these cards into rhe envelope, back outward.